Ever since I put the Hydrovane self-steering on my Pandora 22' and found out how fantastic it is to have a totally reliable 'helmsman' who never gets tired in any conditions, or handle any sea and wind, I have been passionately in love with self-steering gears. It completely changed the kind of cruising I could do. completely silent - I only like to use electric autopilot when motoring on small boats, as for me, the constant chirping they make spoils the ambience of sailing. if your electrics get wiped out (happened to friends going to Bermuda), or batteries die, you still have the vital self-steering available. self-steering geometry is arranged to let the boat luff up automatically in strong gusts. when beating, the vane will follow every wind shift, instantly, keeping the boat at the optimum angle to the wind - one reason I don't like using electrics on this point of wind. Electric autopilots can be fitted with a small vane but I don't know how well this works. vane gears are much more reliable - many manufacturer's now guarantee a circumnavigation trouble free. My electric Autohelm 2000 literally ground to a halt with corrosion after just a year in the Bahamas (even though I only used it when motoring.) Cruising sailors I talked said it was common for their electric autopilots to fail. The only exception was electric, or electric hydraulic units, installed below decks which seemed to be quite successful. I know Raytheon/Autohelm etc. are much better in this regard now so hopefully this will solve the corrosion problem. I was fascinated in Norfolk, VA, where many sailors set off for Bermuda and the Caribbean, at how many were installing vane gears after meeting experienced sailors they met there. I have always considered hand-steering and cruising mutually exclusive - you are just too busy with higher priority tasks such as navigating, keeping a look out, maintenance, or just reading! Sure, I like to take the helm once in a while but an hour a day is more than enough for me. I was amazed at how few cruising boats had auto-pilots or self-steering gear when they are doing serious cruising. Even travelling around the Bahamas only a tiny minority had gear installed, though many, but by no means all, had electric auto-pilots - I guess some people like to hand-steer all the time - I just can't imagine doing that, especially in windy weather (its always blowing 20-30 knots down south in the winter months), it would be gruelling, even with two people, since you frequently sail 10 hours per day, every day, for weeks sometimes. I suspect this has changed now with the excellent electrics on the market. I am also somewhat horrified by how many serious cruising boats are manufactured with wheel steering when tiller steering is so much better for either electric or vane self-steering. I suspect people never even think about that. Look at all the BOC and Vendee Globe yachts - they all use tillers even though they are 60 feet long. The most common gear failure I heard about down south was the cable which links the wheel to the rudder quadrant. As cruising boats are on the go so much this wire cable 'work hardens' over time and fails, usually at the worst time during a passage. A system with gears rather than cable is much better, or else make sure the cable is replaced frequently. It is true that self-steering gears are expensive but given the cost of the boat in comparison I don't see that as an issue. They also tend to hold their value well as the few parts that wear are easily replaced. I can appreciate the aesthetics might be a problem to many people. I believe quite a few people are intimidated to some extent by self-steering but they are very easy to use, a few hours of playing around with it and you will feel very comfortable. Modern gears are so sensitive and powerful that they will work very well without any 'tuning' to be done. You can have just the main up, or just the jib - it will make no difference to a servo gear (horizontal axis, servo systems have ten times the sensitivity and power of the old Chichester/Robin Knox-Johnson type.) With a light wind and just a few knots of way you will have over 100 lbs of force being applied to the tiller with precise control. In any good wind a gear will easily produce 300 lbs of force to the tiller. They work just as well downwind - I never had my Pandora or Contessa gybe under self-steering. One point I would like to make is that if you do have a self-steering gear, make sure to bring the control line (the line which sets the angle of the vane to the wind) to a point close to the front of the cockpit (it is great to be able to tack the boat while sitting reading a book, or out of bad weather under the dodger.) I had my control line make two turns around a small winch which had its pawl removed and a permanent small handle installed in the winch so I could control the vane angle precisely just moving the small winch handle. 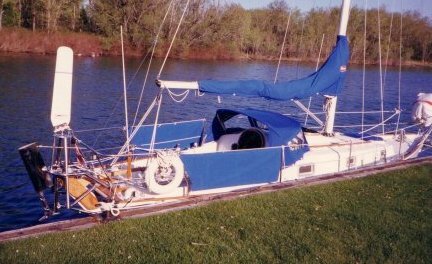 I could also tack the boat 'automatically' by just giving two full turns on the control winch and the self-steering would tack the boat perfectly through 90 degrees - while I let go the jib on one side and winched it in on the other.